If you can tell me how to do it then i will. Can't suss out this 'Host Image' button. Anyone got any good video of the left hand side of the stage (if you were on it looking out)? I was immeadiatley next to the internal walkway and on the second row. I've spent a few hours trawling through You Tube and all the close ups seem to be on the other side of the hall!!! There was a kid behind me and his folks were videoing loads! my dads uploading some vids, hes got vid from all over the place hes just putting it together will let you know when it's done with a link to them. The following link is to a short video of my record of the day, which signalled my 'public' return to drumming after 24 years away from a kit. I had to 'borrow' a small clip near the end as my tape froze, so apologies to whoever shot that, I hope you don't mind?! CAN YOU SEE ME NOW?!!!!!!!!!!!!!! chopper wrote: CAN YOU SEE ME NOW?!!!!!!!!!!!!!! How the hell do you reach the tom at the front are you ape like? Ooo!! This was the drummer I was set up in front of...! I nearly got in a picture there!! Hey Martin, I didn't know you were going to be there! Wish I'd known, I would have come and said hello! Here's some links to a 3 part video that my dad made of the day. I didn't put the other tom on at first becasue there was a space next to me and i didn't know if there was enough room, but it went on in the end. Talking of tom possitioning, i did see some kits set up up in what i would call Argos style where there was about a foot between the toms. 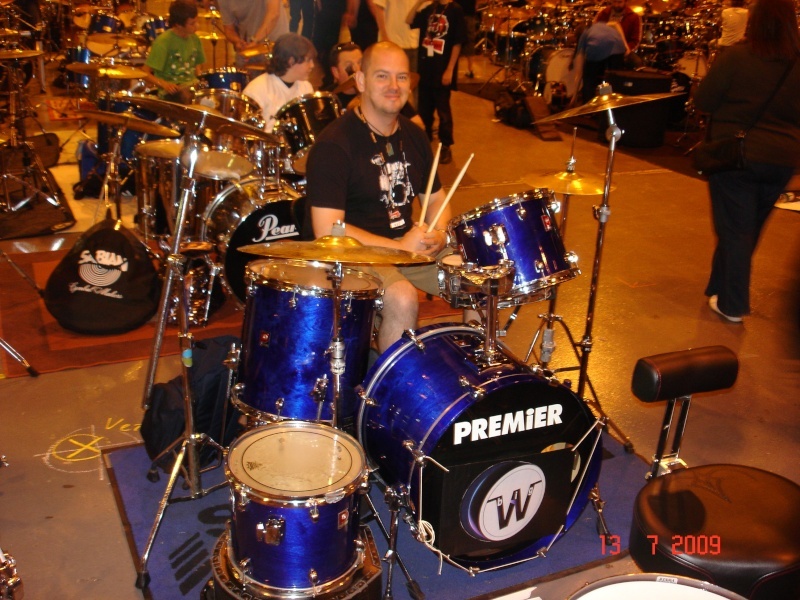 I did see one kit where the batter heads on the toms were at 90 degrees to the bass drum!! They got the date wrong but there are some great pictures. BEV wrote: Here's some links to a 3 part video that my dad made of the day. Hurah! I am sort of blurry on the 3rd one about 4mins and 20 in. Starting to think i wasn't there!! !